Where I Work: Ratheesh T.
I enjoy living in the city but prefer the people and landscapes of my native village. So I divide my time between two places — my studio in Trivandrum and the old family house in Kilimanoor where I grew up. My studio is spacious, allowing me to step back far enough to assess my large-scale paintings. Like most people, I find it hard to work out of my bedroom and am extremely happy to have found a studio space in this quiet part of town where many other artists live. I moved into this neighborhood when I first came to Trivandrum to study at the College of Fine Arts in 2000, and have been here ever since. Some of my fellow classmates and artists, including Jyothi Basu and Gigi Scaria, used to live here. Every place is fine, as long as you’re happy there. Most local artists have migrated to other parts of the country but I like being in Kerala. I am inspired by its people and landscapes. I think my practice would change if I moved to a different place. My purpose as an artist is to explain the present situation. My medium of choice is oil on canvas and my subject is daily life. I don’t believe in trying to change the world. I like to look at reality and paint life as it is. I want my art to evoke an emotional response in the viewer. I paint from life but my work references visceral universal experiences. 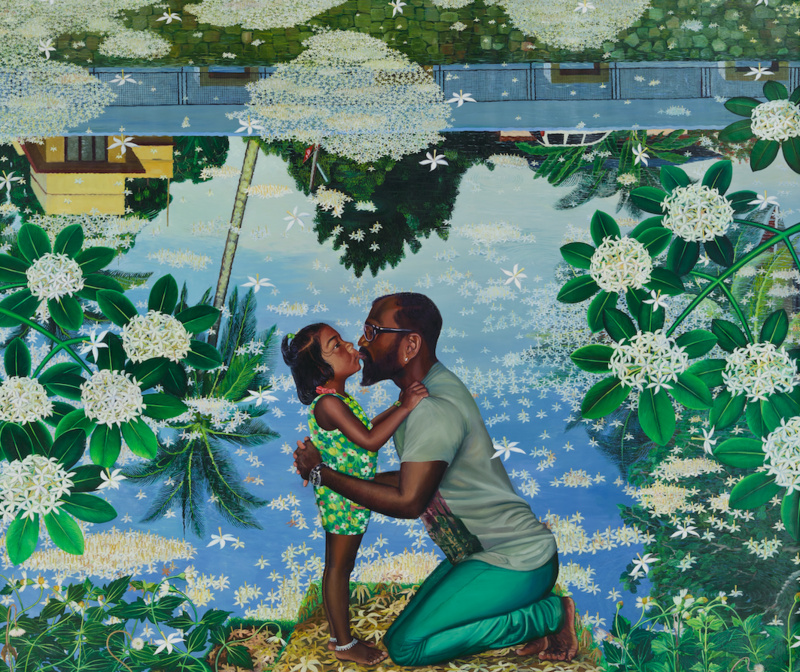 People, whether in Mumbai or Berlin, have really connected with some of my paintings — like Kiss, an image of the unconditional affection between father and daughter, and Amma, which shows my mother putting rice in my plate. That feeling of love is the same all over the world. Visions and dreams inspire most of my art. The colour scheme, size, and idea all come to mind at once, and I know that I have to paint the vision while it is still clear and fresh in my head. I begin by sketching the canvas and it can take a month or two to complete the piece. I always make art at night, it’s the best time for me. I start at 11pm and continue working until 5am! On some days, I don’t work at all. I do normal things, like eat, watch television, laze around, go for long walks, and chat with friends. I’m still always thinking about work, though. I take time away from the canvas to develop thoughts and ideas by observing life around me. Painting is just a way to understand these thoughts and share them with the world. I live alone and don’t follow a strict routine. My main problem is that my lifestyle makes it hard to spend time with others. I like to think of myself as a lone bear, remote from society. I do not plan my life. So talking about where I see myself going has always been difficult. I don’t know what the future holds for me at all! Ratheesh T. was born in Kilimanoor in 1980, and lives and works in Trivandrum, Kerala. 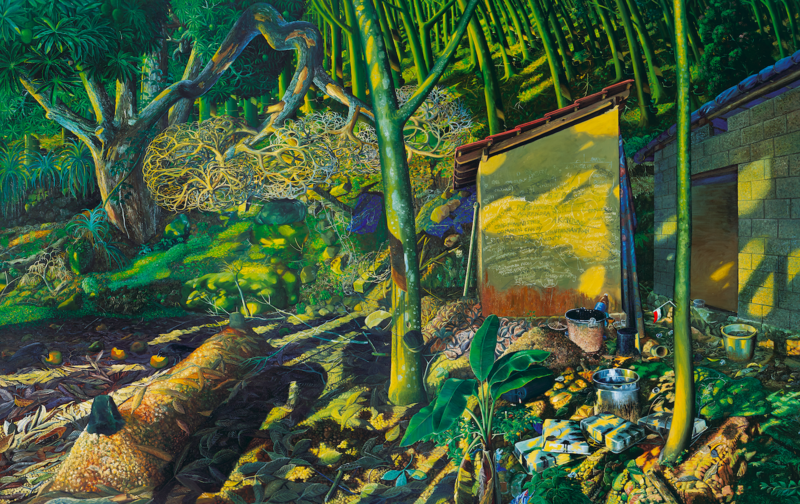 He is represented by Galerie Mirchandani + Steinruecke and has shown his paintings at India Art Fair 2019.